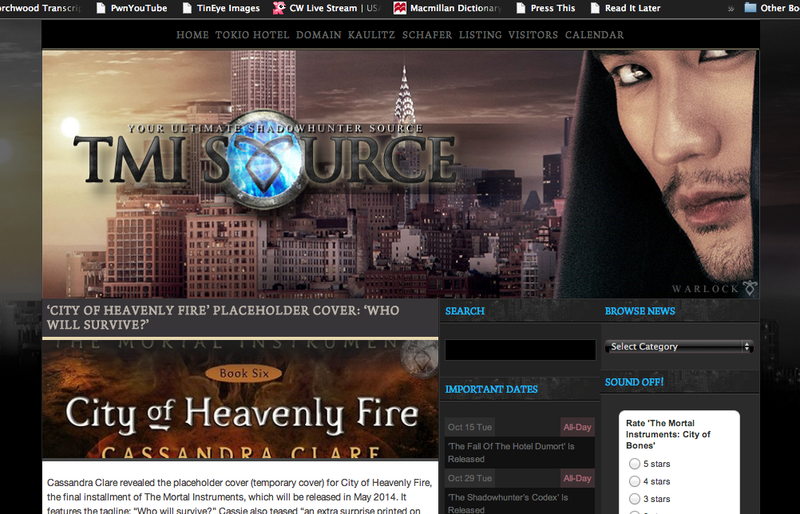 Today seems a good day to reveal the placeholder cover for City of Heavenly Fire! This is not the final cover, but since you’ll be seeing it all over, on amazon etc. until they reveal the final, might as well see it here first. I did not come up with the tagline, but I like it. How excited/nervous/anxious/terrified are you for City of Heavenly Fire? What do you think of the placeholder cover? And do you think that “extra surprise” inside the cover is? Sound off in the comments! OH MY GOD IT’S AWESOME AND WAY BETTER THAN EVERYTHING I’VE IMAGINED! Amazing!!!!! I’m sooo excited. There are moments when I don’t even care who dies(even if it was clary and jace). That’s how excited I am. I think Clary, Jace and Sebastian/Johnathan should be on the cover. All three. If not then put Magnus. I didn’t just read that! I think the cover’s great but they keep putting brown and yellow.. .. the design’s perfect though. “Excited/nervous/anxious/terrified” is the understatement of the century. Does anyone know when they’ll reveal the actual cover? me neither this book is gonna kill me if anyone dies in this book ahhhhhh Cassie why!!!!!!!!! So excited!!! I know she said Clary was going to be on the cover, and as much as I love the TMI characters, I would rather it be more about TMI. I think it’s going to have Sebastian with her. it would be really cool to feature izzy on the cover though i’m not sure if cassie said male or not. THOSE ARE FIRE WINGS OMFG! Sebastian is gonna bring the hell to New York im pretty sure of that….! what does she mean by surprise¿? Mom: WHAT? Then what’s coming out in October? it’s amazing! 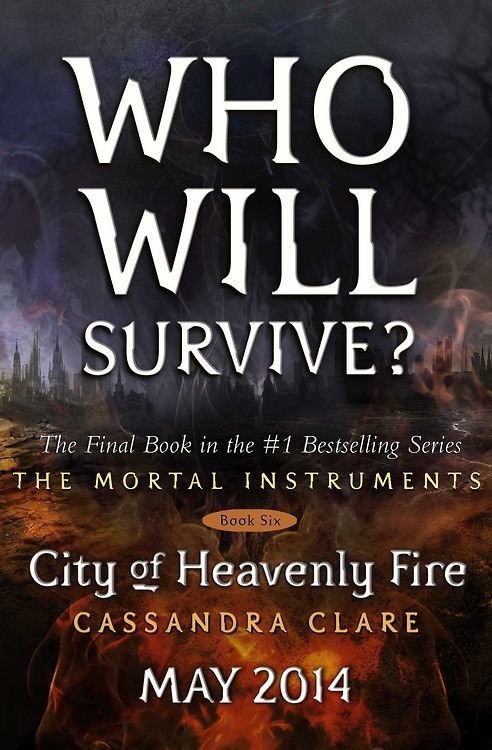 perhaps thr fier repersents the heavenly fire from God, the angels and heaven and also jace’s fire? i’m excited, axnious, eager and nervous and scared and will be sad lol but i will love it and laugh too! Well, I think that Clary and Jace have a gurenteed spot on the cover, if not Sebastian and Clary, which I think would probably fit since technically it’s their final battle (hopefully) so, it’ll be a Voldemort vs. Harry on the Deathly Hallows cover, maybe. The surprise could be so many things–the complete Family Tree(In fold out form), a portrait of all our favorite characters–both dead and alive–by Cassandra Jean in actual full color–with like a background and everything. Or maybe it could even be and alternate cover, like a cover with all the characters on it against the entire New York City backdrop, though this isn’t likely, still, we can always hope. I think it could also be some poster with a printed Cassie Signature on it. Oh the agony of waiting! It’s also finally hitting me that this is it, the final Mortal Instruments book–I’m still looking forward to TDA–the real ending of this chapter in the world of the Shadowhunters. At least we might get to see Tessa and Jem, or at least Jem as Zachariah before 2008 arrives in the books. That’s one thing that has amazed me is the fact that Clare has actually stayed in 2007 for about 7 years now, it’s really amazing. May cannot get here any faster! I think in the book Clary will create a rune that turns shadowhunters into full angels or can sum an angel’s help without the need of the mortal instruments. isnt that what tessa can do do you think tessa might command………..
What city is in the background? I’m for sure going to die when I finish reading it..
Why are we getting a placeholder and not the actual cover? We know the cover is already done, so why not just release that instead of this placeholder? Other books which will release next year already have their cover revealed. ‘The One’ by Kiera Cass will also release May 2014, and that one already revealed it’s cover..?! I agree!! They should release the cover! The cover reveal must be 6 moths before the book release. Oh god, I’m gonna cry so much. Ohh………………My……………………..God one word is all i can say as i am speechless…………..Perfection!!!! I AM SOOO PSYCHED!! CAN’T WAIT!! (OH, and since I couldn’t contact you any other way, I’ll note here …I just wanted to let you know that we (I do web designs w/ Maramber Studios) have a new TMI design that I thought you might be interestd in. who else thinks that if you stare at the cover long enough the shadow thing looks like 3 peple?? Yes I am VERY EXCITED, For City of Heavenly Fire!!! 🙂 I wish it was out NOW. I am very curious who will survive, and have feeling I won’t be happy who dies. But I know it will be an AMAZING book. I am curious what is on the in side cover too. I don’t want TNI to end, but all great things must. Plus then the Dark Artifices will be out next YAY! I wonder if they will have other family trees? ?